Louisville, Wilson, Rawlings, Easton and Nokona are the brands we carry. 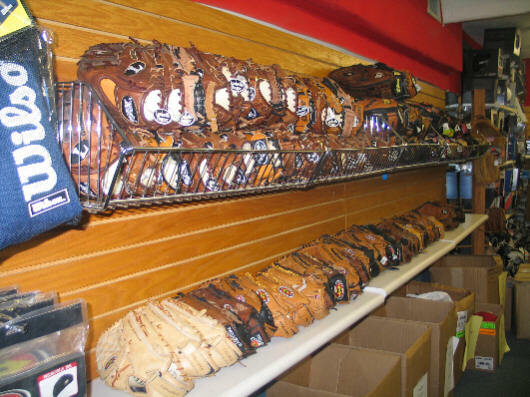 Ball gloves from $14.95 to $259.00 ( Nokona) , Aluminum bats (Tee ball, little league, slow pitch, and fast pitch) Wood bats from Louisville and Rawlings for Little League and Adult League. Catchers equipment and Batting Helmets from Wilson and Rawlings for Tee Ball to High School Ball. We have all the accessories you need: bat bags, rosin bags, eye black, sweatbands, umpire equipment, practice balls to game balls. Check it out.